Anyone familiar with my writing knows that I love a good portal fantasy. People from our world thrust into a world of magic and adventure has almost limitless possibilities in how the story could proceed. My own first experience with the genre was a series of books by Joel Rosenberg called Guardians of the Flame that I read back in High School in the late 80s. So when I saw an ad show up on my Facebook feed a few years ago advertising a portal fantasy comedy series, it was an easy bite. This isn’t a 2019 read per se, as I read the latest installment last year. But on a recent drive taking my daughter back to college I bought book one on Audible because I’d heard great things about it. 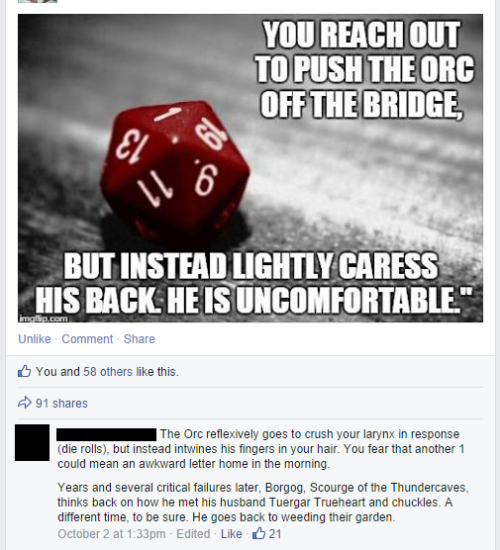 In gaming a critical failure typically results from rolling a 1 on the die, and often leads to hilarious mishaps (here’s a famous meme example), and Bevan’s characters are, themselves, a bunch of failures. Tim runs a sketchy fast food restaurant called the Chicken Hut, and Cooper and Julian are adults whose professional careers have peaked at the role of Pizza Delivery Boy. After annoying their new “Cavern Master” Mordred with off color jokes about his appearance, his mother, and any number of other things, Mordred uses his magical dice to send them into the C&C world to fend for themselves. Unfortunately, the very last thing that Cooper did in the game before this happened was to jokingly chop the head off a local guard. I mean, he was just an NPC anyway, and not even an important one, so why not? Unsurprisingly, the local militia has a very different opinion and the disoriented players suddenly had to deal with the consequences of their idiocy. This begins a series of (mis)adventures that span six full length novels and thirty or so short stories. The vast majority of the humor is off color, juvenile, and either focused on someone’s mother’s loose morals or related to farts and other bodily functions. Cooper’s character is, after all, not only a jerk, but also a half orc with a Charisma of 4. For those unfamiliar with D&D and similar games, this makes him not only universally unlikeable but almost guaranteed to say the wrong thing at the wrong time, often accompanying his verbal diarrhea with literal poop dripping down his legs. For some, this line of humor will quickly go stale. For others (like me) it never seem to get old, just like people still find “That’s what she said” funny all these years after its first utterance. And just in case there was any doubt, the series’ tag line is “Swords, Sorcery, D*ck Jokes,” and one of the novels is subtitled “The Phantom Pinas.” A pinas is a boat, but, well, you can guess where the jokes went with that one, especially since a pinas is a kind of junk. One last thing to mention is that the audio book is every bit as great as I had heard. The voice actor plays with accents, affects and volume to give each of the main characters (and some of the minor characters) distinct personalities in a way I haven’t always heard. If you’re an audiobook person, this is a great one. Buy if: You like stupid, rude, or raunchy humor in your fantasy.